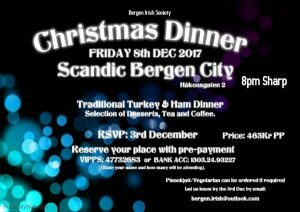 Scandic Bergen City is booked again for the 8th of December for our Christmas party. This will be our third consecutive year in a row with the traditional turkey and ham buffet, selection of desserts together with tea/coffee. All for a fantastic price of 465kr. We always get great service and great value for money. Pinnekjøtt, Vegetarian or special dietary requirements can be ordered on request. Please send us an email to bergen.irish@outlook.com regarding this before the 3rd of December. This year we will be asking members/non-members to pre-pay and reserve their place before the 3rd of December. Final numbers will be given to the hotel on this day. No reservations can be made after this date. Bergen Scottish Society kindly asked if they could join us for this event. So hopefully we’ll get a good atmosphere with a lovely Celtic fusion. There’ll be music through the decades so something for everyone to enjoy. Payment can be made two ways, by Vipps or through our Bank Account. Please state your name and how many will be going in the transaction. We are looking forward to celebrating with you all! We gratefully acknowledge the support of the Irish Embassy in Oslo, and the financial assistance provided by the Irish Government for creation and maintenance of this website.